Ready, set, Chardonnay Go! This wine-fueled and themed board game is packed with hilarious questions and make-you-blush dares. 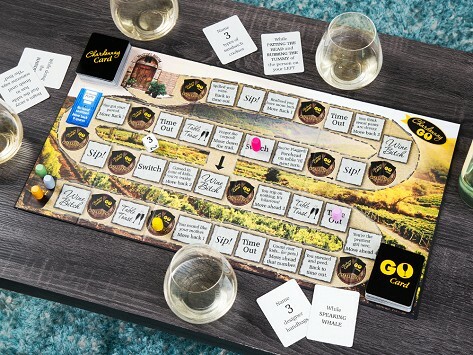 Travel through the vineyard-inspired game board with the goal of reaching the tasting room. If you can make it without falling over with laughter (or spilling your wine), we salute you. Dimensions: 13.5" x 3.5" x 3.5"
Set up the game and played a trial run. We laughed so much at the cards. It's not for kids for sure. We played this on New Year's Eve!! So fun! Well worth the money! Haven't laughed that much in a long time! Loved it!! Dena Blizzard is the mom behind One Funny Mother, and her self-professed title is accurate. Her parody video of suburban moms dashing around the neighborhood in search of glasses of wine was a viral hit—so much so that Dena thought ladies like her would want to get together to play it in real life. If Chardonnay Go was a movie, it would be rated R. It’s risque, hilarious, and inspired by wine, of course. The object of the game is to move along the vineyard-themed board to reach the finish line, also known as the tasting room. But the actual playing of the game is the real prize here. Bawdy dares must be completed (example: Name five dead presidents while laying an egg on the person to your right) or you’re sent to time-out. It’s definitely for grown-ups only and though Dena made the game with a girls night in mind, men can play, too, which makes it even more fun.